Beautiful Blue Background. The inspiration for the beautiful blue background on this card came straight out of Stampin’ Up!’s 2016 Annual Catalog. Page 86 features a beautiful card that showcases this Petite Petals stamp – it’s stamped over and over in varying colors around a sentiment (pop over and take a look!). I started at the top of the page with the lightest blue (Tempting Turquoise) and made my way down the page a bit before switching to Pacific Point and then Night of Navy. I allowed the stamps to layer a bit for a beautiful effect. Extra White Space. The entire background panel is filled with blue flowers that create a wonderful texture and back-splash of color. To keep a clean look, though, I chose to add a Whisper White panel over most of the flowers. While it hides most of the flowers I stamped, it allows the ones left showing to play a more important role in the overall whimsy of the card. Piecing Sentiments. 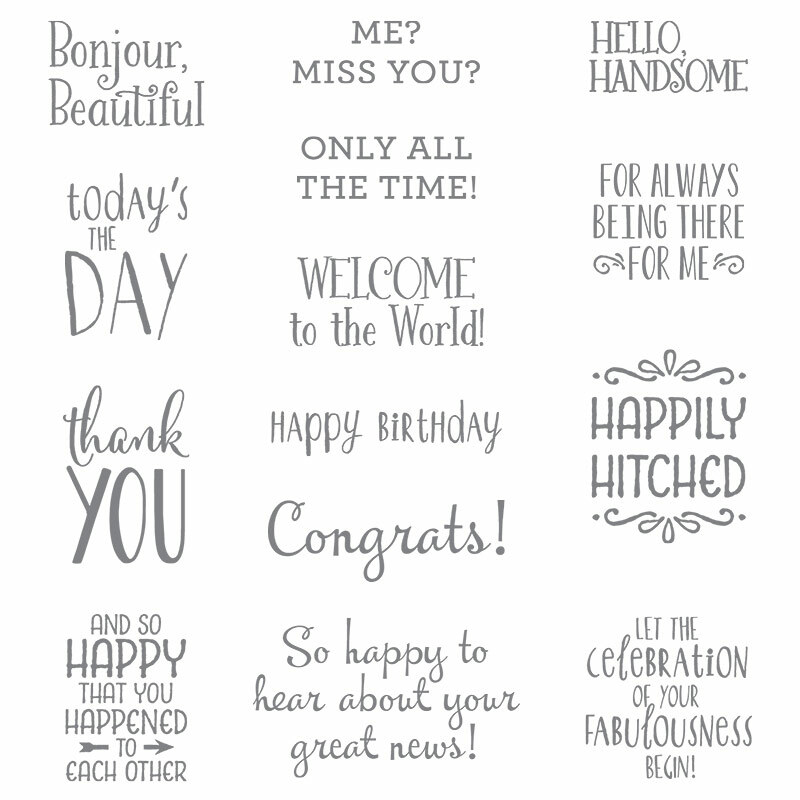 Since I my eyes first settled on Suite Sayings in Stampin’ Up!’s 2016 Occasions Catalog, I hoped it would carry over. Forever and ever. My favorite of them all is “thanks for being you.” I love the combination of fonts so much, but…I don’t always want to say those particular words. 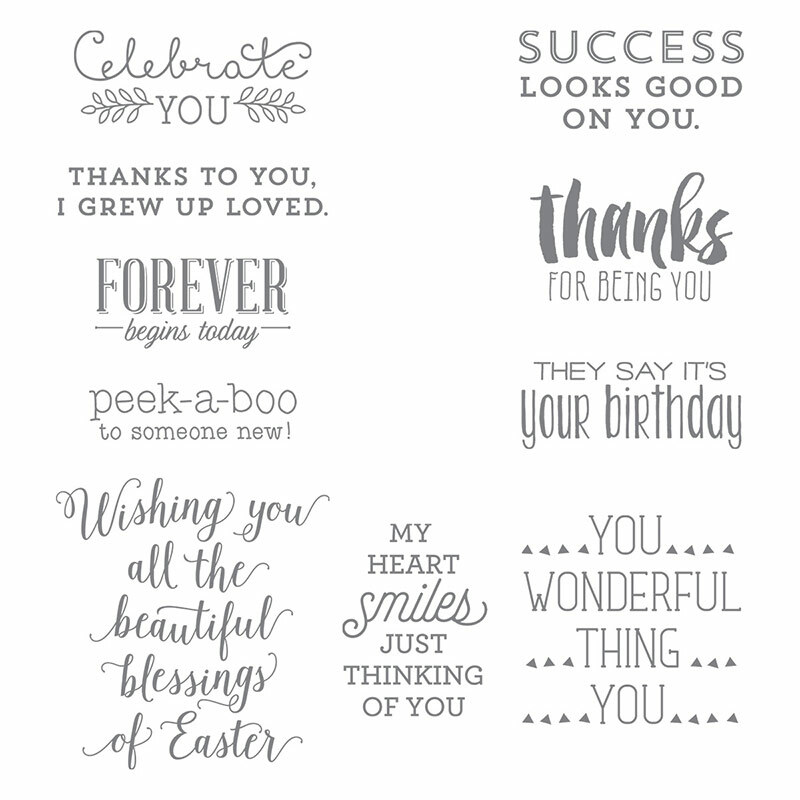 With a little masking and stamps from other sets, I can say “thanks so much” or “thanks to you” or “thanks for always being there for me.” The latter is a combination of the “thanks” from Suite Sayings and a sentiment from Happy Happenings. I hope you’ll pop over to the Fab Friday site to see the cards by the design team members and to play along with this week’s challenge. Do you like free stamps? You’ll earn two from stamp sets when you buy Stampin’ Up!’s Starter Kit in June. What a great way to check off your wish list of the items you already want! Click on the picture below to read more about this awesome promotion. Earn $35 Additional Stampin’ Rewards in June. Yippee! With qualifying orders of $35o or more, you can earn an additional $35 of Stampin’ Rewards to spend on whatever you want. Click on the picture below to read more about this great promotion. Brilliant, Brian – your creation of the background then covered with white which highlighted those blue flowers even more, and the layering of the 2 sets of words. Just brilliant. Thank you for all that you share. I just love this stunning card, Brian! That background was a clever idea. Wow! Adore the ombre effect of the floral background! I’m not sure how I would have handled this color challenge but you did it beautifully! Why oh why am I not surprised! LOL Just a glorious card Brian, as always. Ooooo, Brian, I made one like that with the same set, I love yours !!!! I love it! The colors are beautiful. I love the splash of red. Love these little flowers ! Brian, I love the way you showcased that bold sentiment, it just pops right at you!! The Ombre background is fabulous. I like this color combination, I might have to get to work with it. I love the ombre background and the bold sentiment with this color combo. Great card. Mr. Brian! I love this, I’d like to borrow it for my stamp group, I’m sure they’ll love it too. Thanks so much for sharing.